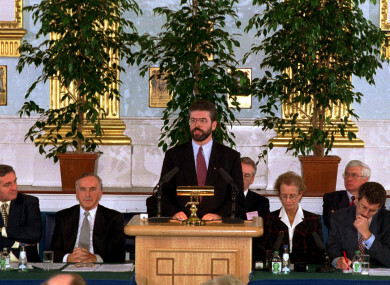 Sinn Féin President Gerry Adams addresses the Forum for Peace and Reconciliation in Dublin Castle,1994. SINN FÉIN WILL hold an Ard Fheis before the end of February next year to elect its new Uachtarán. At an Ard Fheis in November, Gerry Adams announced he would step aside as party leader after 34 years in the position. Already, Sinn Féin finance spokesperson Pearse Doherty and housing spokesperson Eoin Ó Broin have confirmed that they won’t contest the leadership. Deputy leader Mary Lou McDonald, meanwhile, has thrown her hat into the ring, and is most likely to succeed Adams as party president. Speaking during a break at today’s Ard Comhairle meeting in Dublin, Sinn Féin Chairperson Declan Kearney said that Adams had requested a “special Ard Fheis” before the end of February, and said that nominations would be accepted in the New Year. He said that the party’s new leader would most likely face a general election in 2018, and would promise to tackle “crisis in health” and help the “thousands of our children homeless this Christmas”. “Our new leader will lead the only all-Ireland political party, one which is uniquely placed to meet the challenges and resist Tory attempts deliver a hard Brexit and a hard border. “We also remain committed to seeing a restoration of the Good Friday Agreement political institutions on the basis envisaged in that and subsequent Agreements. We look forward to another historic Ard Fheis and a healthy and democratic campaign to elect the next Uactarán Shinn Féin. Email “Sinn Féin will have its new leader by the end of February”. Feedback on “Sinn Féin will have its new leader by the end of February”.